This healthy urad dhal stuffed kozhukattai is done during ganesh chaturthi. Heat water in a heavy-bottomed kadai, add salt and oil. 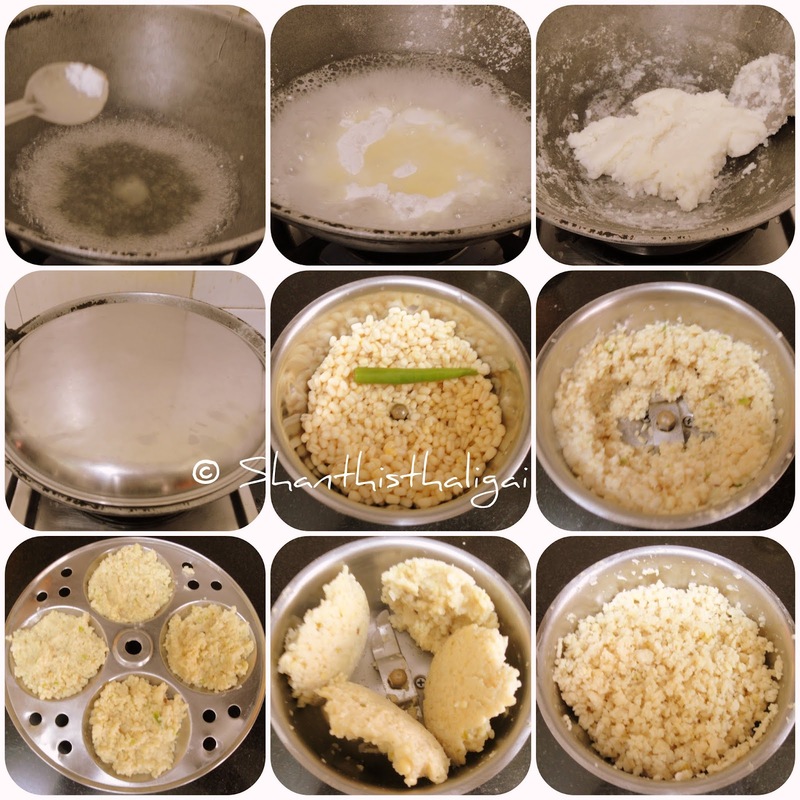 When it starts boiling, simmer the stove and add the rice flour slowly and stir it quickly without any lumps. When it leaves the sides of the kadai and becomes like a dough, take it off the stove and keep it covered for 10 minutes. When cool, knead well and keep aside. Soak urad dhal in water for 45 minutes. Drain water completely and grind alongwith green chillies to a coarse paste. DO NOT ADD WATER. Transfer it to a wide vessel, add salt and mix well using your hand. Make patties out of this mixture. Grease an idli plate, place these patties, one on each dent and steam for 7-8 minutes. When cool, pulse in a mixie to crumbles. In a pan, heat oil, add mustard seeds, when they splutter, add hing, curry leaves, crumbled mixture,grated coconut and saute for a couple of minutes until dry. Now add coconut and stir for a while. Switch off the stove. Cover and keep aside. Grease your hand with gingelly oil. Take out small balls from the mel maavu and flatten on your palm to a circle. 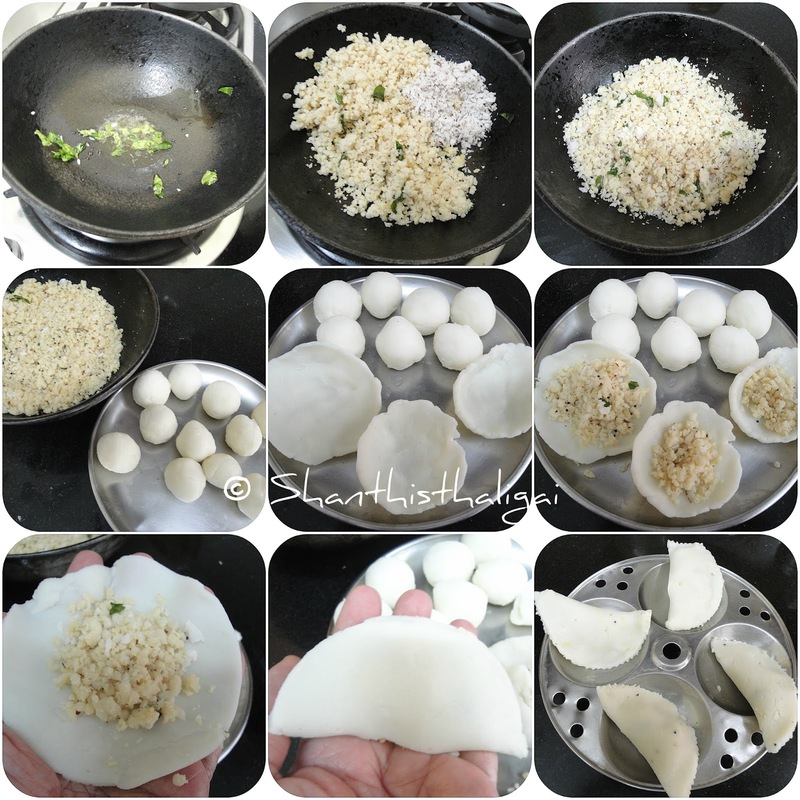 Place a tablespoon of poornam(filling) inside it and fold it to a semi-circle and seal the edges. Grease idli plates and arrange the crescent shaped kozhukattais in it. Steam cook for 10 minutes in medium heat. Allow a standing time of 5 minutes. Offer them to Pillaiyaar when done. 1. Always keep outer covering covered, to avoid dryness and cracks. 2. Grease your hands for each kozhukattai during shaping. 3. Only one or two kozhukattais should be arranged in one dent of the idli plate. 4. Perfect kozhukattais will be glossy when done. wow such an yummy and delicious kozhukattai :) love the filling !! This was our favorite after school snack but mom would just mix everything together, Love the idea of filling it! lovely, delicious kozhukkattai.. First time here. Nice space. Glad to follow you. Do visit mine if you find time.